If you’ve made it to Day 7 which is the last day of the GM diet, then you’d have noticed a significant weight loss for sure. And, in addition to that, you will feel and look great both inside and outside. Those who landed on this page directly can follow our detailed diet plan sorted by day – Day 1, Day 2, Day 3, Day 4, Day 5 and Day 6. When you entered the GM Diet Day 7, you should see the following changes in your body as well as lifestyle. You’re slimmer by at least 10 pounds. You notice a glowing skin. Finally, you become much more active than before. If you notice these changes, then I’m sure you’ve done the GM diet perfectly without cheating. Now, it is time for you to finish your final day of General Motors diet where you can have lots of juices. How to Prepare for GM Diet Day 7? All you need to do is to stack the fresh fruits for Day 7. You can eat fruits at any time of the day starting with breakfast to snacks and dinner without any limitations. 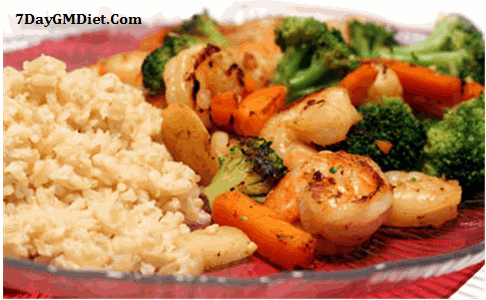 Apart from fruits you should also have brown rice in combination with boiled or stewed vegetables. A few people may not like the brown rice but it is advised not to skip it because it gives you energy as well as fiber. If requires, you can have Cottage cheese (Indian paneer) as a replacement to brown rice. What to Eat on Day 7 of GM Diet? Breakfast: Start with a bowl of brown rice for your breakfast. Brown rice gives you energy and carbohydrates for the whole day. However, you can skip the rice for breakfast and eat either papaya or melon followed by 2 glasses of water. Lunch: If you skip the brown rice during the breakfast, then try to have it now along with cooked vegetables such as broccoli, cabbage and asparagus. You can then have a slice of mango or melon to satisfy your appetite. In case if you had brown rice for breakfast, then replace lunch with any two different fruits + 2 glasses of water. Dinner: Again with brown rice + green vegetables or only vegetables of your choice. Note that you should drink 2 glasses of water before going to sleep. Snacks & Beverages: You can have raisins, strawberries, other fruits during the snack time. Coming to beverages, you can drink water or fruit juice (only during midday snacks). 1 bowl or brown rice along with some cooked vegetable + slice of mango or melon to satisfy appetite. 1 bowl of strawberries or sprouts or fruits of your choice. 1 bowl of brown rice + vegetables of your choice. Drink more water on Day 7 compared to previous days. Exercise more today so that it helps in boosting your metabolism even more, thus it burns a lot of calories than normal. Doing so will also help you not gain weight immediately in the following days while you’re not on the diet. That’s it! Hope you get the same results like hundreds of other followers of the General Motors diet like me. Q1] Can I repeat the GM diet again? Ans] Yes, you can repeat the GM diet as many times as you want or until you hit your weight loss target. But, you should maintain at least a week gap in between the sessions. Q2] I am a vegetarian. Are there any alternative foods for me? Ans] Yes, you can replace Beef with Brown Rice or Paneer (Indian cheese). Find here the General Motors diet for Indians. Q3] Will I put on weight again after I completed the GM diet? Ans] GM diet is meant for people who’re looking to shed their excess weight without waiting for long periods like in other diets. And like any other diet, you’ll regain weight if you try to eat in indifferent proportions without following a proper lifestyle. So, it is advisable to maintain your diet once you reach your ideal weight. Hope you got all your questions answered here. In case if you face any difficulties or need any help on foods, please do comment on our website and we’ll try to answer them.